Chief Warrant Officer Lewis O. King began his military career on Jan. 1, 1946, when he enlisted as a private in the United States Army. He was assigned to an anti-aircraft artillery battalion at Fort Bliss, Texas, and served in the U.S. Army's first guided missile unit. On Jan. 1, 1949, Chief Warrant Officer King enlisted in HHC, 90th USAR Division, serving in the G-4 section until Dec. 1, 1955, at which time he was transferred to Headquarters, 36th Infantry Division, as chief of supply and logistics as an Army Guard technician. He was subsequently promoted to Sergeant Major and served in that capacity until Nov. 30, 1967, when he was transferred to Headquarters, STARC. He was promoted to the rank of Warrant Officer and assigned as chief Employee Service Division of the Technician Personnel Office. 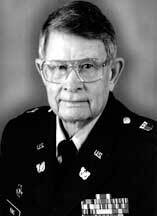 From April 1, 1969 until his retirement on Dec. 1, 1987, Chief Warrant Officer King served as the administrative assistant to the Adjutant General of Texas, administrative assistant to the director of personnel, and administrative assistant to the chief of staff of the Texas Army National Guard. Chief Warrant Officer King assumed the position of associate director of the National Guard Association of Texas on Dec. 1, 1978, and acceded to office of executive director on Jan. 1, 1987. During his tenure as executive director of NGAT, Chief Warrant Officer King was responsible for the sponsorship and passage of numerous bills providing significant benefits for members of the military forces of Texas. Following his military retirement, he has continued to serve as a member of the Texas Guard Legislative Task Force, and during the 76th Legislature played a significant role in securing passage of SB 525 and SB 526, providing extended benefits to members of the military forces of Texas and tuition assistance for members of the Texas National Guard. Chief Warrant Officer King also had provided national leadership in the National Guard Executive Directors Association of the United States, and was instrumental in the debt free construction of the Texas Guard All Faiths Chapel at Camp Mabry. Chief Warrant Officer King is the recipient of numerous awards and decorations, including the NGAUS Distinguished Service Medal, the Lone Star Distinguished Service Medal, the Army Meritorious Service Medal, the Army Commendation Medal and the Texas Meritorious Service Medal.